There is generally a certain level of anticipation when one plays a course for the first time. The approach road to the links of County Louth, or Baltray as it is better known, named after the local fishing village, is especially uplifting. This is a course that has remained relatively anonymous, except to those in the know. It is one of Ireland’s secrets. County Louth Golf Club was established in 1892 but Tom Simpson and Molly Gourlay designed the present course in 1938. In 2003, Tom Mackenzie made some minor changes to the layout, most notably the addition of new tees which has stretched the yardage beyond 7,000 yards. Darren Clarke won the East of Ireland Championship in 1989, an amateur stroke play event held at County Louth since 1941, although it is unlikely that anybody will beat Joe Carr’s record. Joe Carr was the “East” champion 12 times between 1941 and 1969. Amazingly, Joe’s son Roddy won the 1970 “East” championship. County Louth developed two of Ireland’s best lady golfers. In 1938, Clarrie Tiernan was the first Irish woman to play in the Curtis Cup but the USA beat Great Britain and Ireland 5½ 3½ at the Essex County Club in Massachusetts. It was Clarrie’s rival, Philomena Garvey, who was the most successful post war Irish player. Phil was five times a finalist in the Ladies British Amateur Championship, winning once, in 1957 at Gleneagles. Phil also won a record 15 Irish Close titles in a span of 18 years from 1946. Although County Louth is a championship links golf course, golfers of all levels can enjoy it. The back nine is especially entertaining with a number of holes running close to the shore with distant views towards the Mountains of Mourne. County Louth hosted the Nissan Irish Open in July 2004. As a William coming over from Holland to play Golf on the banks of the River Boyne, I was a little curious as to the welcome I would receive at County Louth. 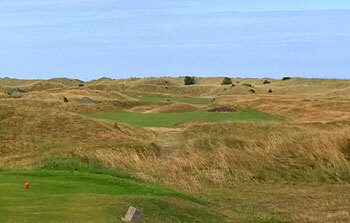 This is a quality links that routes through both the flat and dunes. The green sites in particular were great - framing nice shots in and giving interest in getting up and down when I inevitably missed in regulation. The first 3 Par 3’s were excellent and the fourth potentially so (as it looked like they were building a new green next to the current one). The variety on offer at Baltray is more than sufficient, with a good short par 4 at the 3rd and various long and short fun challenges to follow. It’s obviously a good test too, as they’ve held the Irish Open at County Louth in relatively recent years (Shane Lowry won here in 2009 - as an amateur!). The routing was a bit confusing to a first time visitor, but at least ensured the course played in all directions. The holes through the dunes nearer the sea were most exciting (12-14 I think), but the flatter holes are no less interesting due to gentle movement of the land, well positioned bunkers, and the aforementioned quality green sitings. I’d say the Tom Simpson routing made the best of the property on offer. The course was fully open and the conditioning surprisingly good considering the snow in the area just 10 days earlier. €160 is too much for a peak season green fee - compare this to perhaps €90 at an admittedly more isolated track like St Enodoc - but €80 for County Louth up until the end of March is good value for a course that was very playable at that time. Our second day in Ireland would be the first of true golf, and for that we had chosen County Louth G.C., or Baltray, as it is commonly known in Ireland. From Dublin to Baltray there is not much more than 50 kilometers, most of them by motorway, but it's better to go in plenty of time because access is complicated or at least it's easy enough to go wrong with the exact location. In addition, once we cross Drogheda, each of the small roads that lead to Baltray moved us farther and farther from any populated locality to enter into really isolated coastal landscapes. The welcome that the club gave us could not be friendlier: we barely entered the clubhouse, they sent us to the store, where the employee, after asking us about our origin, kindly explained the essential about the course and invited us to hit some balls in the driving range. Of course, after the inevitable conversation about spanish football. Excited and expectant, we arrived at the first tee, where we found who, at first, we thought would be the starter (in any case, they had not provided us with a ticket or any ticket) and turned out to be a local only interested in knowing if we had bet money on our foursome ... After clarifying that were playing just for the Guinness at the clubhouse, we faced the first holes, (playing from the white tees, which add up to the inconsiderable distance of 6700 yards). County Louth is a true championship course but, to be honest, it should be said that on a sunny, windless day, it is not a particularly complicated course. To this contributes that, as some club members explained later, they have tried to reduce the length and hardness of the rough, once very penalizing. In any case, it is a magnificent golf course. Of the first holes stands out the 3, a par 5 whose green has been placed in a punchbowl and, of course, the one shotters, the real jewel of this course. Unlike what is fashionable today, these are short holes for the modern standards, but that does not mean that they are easy; on the contrary, only a very precise shot to green will give options of birdie or even par, since any mistake can leave us an almost impossible chip. The difficulty and beauty of these holes really surprised us, and even a few days later were the subject of a lively conversation with the owner of the County Sligo restaurant, who had been fortunate enough to play there recently. Decidedly, the second 9 of Baltray, which runs closer to the sea and in a more abrupt terrain than the outward nine, has more attractive and the first 9, and some of them really stay in the memory, starting with the 12th and 13th. However, the one that really stands out among all is the 14th. It is a short hole, of merely 300 meters, and that, therefore, allows different strategies: in our case, from the driver to a hybrid or a long iron to place the ball safely in the fairway. Any shot of modest distance will leave a short approach to the green, but that's where the real problems begin. The green has no bunker to protect it, but it is not necessary either: only a perfectly adjusted shot will leave the ball near the hole, as the slghtest of errors will lead the ball to any of the depressions surrounding the green, a real magnet for balls. From there, the recovery will be almost miraculous, although it will test the imagination of the player: in our case, it was not enough, and 4 bogeys attest to it. From this hole on, the end of the round is also fun, with two good par 3´s, 15th and 17th, and the final par 5. In short, an extraordinary course that leaves you wanting to visit again and again, specially the four delicious par 3´s. Co Louth: Played it this week after a long absence and enjoyed it thoroughly. Nice mix of holes – some in front of you visible and inviting a decent drive, whilst some blind –creating a golfing query but not punishing or annoying. Three par fives on the front and one on the back nine but you have to wait till the 18th hole for this gem. The par threes are a work of art and demand precise hitting as any miss hits on these can leave the player short sided and scrambling to get up and down. The back nine are enjoyable and scenic as is the overall course. Wide fairways and large greens make this playable for all abilities. The transition is a bit puzzling as it is a figure of eight rather than two loops of nine making recall and navigation a challenge. Playing the last hole one can try and relive the efforts of Shane Lowry an Irish Amateur taking on the professionals to win the Irish open after playing the final hole three times to win the tie hole. Top 10 in Ireland. In my view, a rather prosaic start and finish marred what is nearly an outstanding course. Don’t get me wrong, Baltray is a very good links and it’s supremely challenging, but it’s a notch away from greatness. County Louth has been on my to-play list for more than 20 years and I played it in the company of Fergal who is getting married near here on Tuesday. His delightful fiancée, Karen (and her mum), joined us on the front nine. We had an absolute blast in the sunshine and my overnight stay in the simple dormy accommodation concluded a memorable day. The expansiveness of the Baltray property took me by surprise. The acreage here is vast and there is a genuine feeling of solitude, perhaps even isolation at the outer reaches. I agree with the previous reviewer, the golf is better the further away you are from the clubhouse in dunes and along the coastline. The routing zigzags in all compass directions, allowing the wind to conduct proceedings. Its loose figure of eight layout for both the outward and inward halves is a clever way to return the golfer to the vicinity of the clubhouse after nine holes. There is nothing quirky about Baltray, it’s pure links golf which I adore. However it’s quirkiness that sticks in my memory and despite solid hole after solid hole, Baltray didn’t quite capture my imagination – possibly due to the fact I played Baltray directly after experiencing the thrills of The Island. Never before have I seen so much bracken flanking links fairways, the club has even taken the decision to place marker posts in the rough to help with wayward ball spotting. These deep green swathes of ferns create a feeling of lushness that a links course doesn’t need. These small gripes aside, I thoroughly enjoyed my time at Baltray and felt the first three of the four par threes to be excellent and the par fours, except perhaps for the 1st, to be very strong. Not quite an icon in my opinion, but a true classic links that thoroughly deserves its high ranking. The farther away from the clubhouse you are at Baltray, the better the golf. The first two holes are quite ordinary, but things get much better at the 3rd, a par five to a left-sloping punchbowl green. Holes 4-8 are set among the dunes and take fine advantage of the terrain. Getting closer to the flat land that surrounds the clubhouse makes for three holes of duller golf, but the 11th returns to the dunes and features a brilliant green site set behind a doorway in the dunes, not unlike the 2nd at Newcastle. The fun continues until one reaches the 17th, a flat par 3 with no distinguishing features. The 18th takes one home on more flat land, though it’s made interesting by the fairway bunkers that can threaten the second shot. County Louth’s greens have a reputation for difficulty, but they have fewer interesting contours than one finds up at Portrush or just down the road at The Island. The routing is not the out and back type often found on links courses. Rather the holes run in all directions, forcing the golfer to combat the ever-present wind in a variety of ways. But it’s not at all intuitive and includes a number of lengthy walks from the green—including the 18th which finishes a full long iron from the clubhouse. There seems to be more duneland that sits vacant and could have been used to replace some that sit on flatter terrain. The result is eleven holes of 6 ball rated golf and seven of 4 ball. Played Baltray as part of a 4 course trip to the Dublin area during late September with all 8 of us walking off the course in wholehearted agreement that this is a great course and a serious challenge. The greens were some of the best we've played on and were lightening fast making the par 3 5th and 7th incredibly tough. The 12th hole was probably the stand out hole however you could pick from many. A great course, in great condition rounded off by a great team. Played County Louth Golf Club on July 19th in the late afternoon. The links is a par 72 that measures 7,031 from the blue tees to 6,338 from the green tees. It was the first links visited on this trip and was a pleasure to play. County Louth played hard and fast and the breeze was coming in from the Irish Sea on this afternoon. The greens were pure, consistent throughout the round, and were a good speed. For this review will use the distances from the white tees. Fellow golfers told me to enjoy the view from the 14th tee and playing a true links course. I can say that I did enjoy the view from the 14th tee and the challenge of playing every shot on this perfect day. I am glad I made the trip along the River Boyne to get to the links that just seems to be a natural fit between the River and the Sea. I can appreciate the original founders of the links crossing the River Boyne in a boat and declaring this property, "one of the best pieces of golfing ground in the world". The front nine has 3 par 5s that are all in different directions and got to experience the holes with the wind (number 3), against the wind (number 2), and a cross wind (number 6). Nice routing of the holes with birdie opportunities presented here with well played shots. On this day the par 5 3rd was the easiest to reach in 2 but you must be accurate and avoid going to the right of the green. There is a little more room left of the green and a relatively easy recovery shot. Three of the four par 4s on the front measured over 400 yards. The 344 yard 4th was the one breather hole but on this day played directly into the wind. The 433 yard first played with the wind coming from the right and has well placed bunkers off the tee. The 409 yard ninth played downwind on this day with the green protected by a large bunker in front and bunkers on both sides of the green. I thought the drive on the 407 yard eighth was the most visually appealing of the nine. From the tee it looked like the fairway ended after the fairway bunker on the right but upon getting near the bunker could see a narrow strip of fairway to the left of the bunker. Just a nice golf hole. The two par threes on the front measured 158 and 153 yards. On this day I thought the 153 yard 7th played more difficult. The elevated firm green is protected by 2 bunkers in the front and the wind was coming from the left on this day with the pin in the front. The back nine only has one par 5, the 541 yard 18th, which has many well placed bunkers the entire length of the hole. The two par threes on the back measure 152 and 179 yards. Number 15 played into the wind and number 17 played with the wind. Both were solid short hole challenges. The six par 4 yardages ranged from the short 322 yard 14th to the long 464 yard 11th. I thought the 11th was the most difficult par 4 on either nine. The view from the 14th was magnificent and even though the hole is short the putting can be very difficult and chip shots require creativity. On this day the 10th played into the wind and was a nice challenge. The wind was coming from the right side on the 12th and 13th holes and both holes were excellent tests of shot making. The 16th was a nice 401 yard dogleg right hole with well placed fairway bunkers and a wide narrow green with a large slope in front of the green. A truly memorable experience from the moment I arrived at Baltray. Friendly reception, adequate rental clubs, hospitable members of which I joined 3 players for 9 holes as it was their 9 hole Monday morning regular half round. The links course is sublime, the dunes spectacular, the rough quite challenging but fair and the bunkers as you'd expect- small and mostly pot and requiring you to take your medicine and get the ball back into play. The routing and the greens the most excellent thing that will want you returning again and again. The greens relatively small with not much undulation but the roll and trueness is the thing you will love about putting. After the round I met the captain and the GM and received a club tie as a thank you for visiting and to encourage other members from my club to visit when staying in Dublin. Hard to argue about a better experience inside and out if the club. A must! Andrew Tierney, Royal Adelaide member. County Louth is a top place. Front 9 is very good, the back 9 is excellent, as good as nearly anywhere. The welcome couldn't have been friendlier from the Paddy (the pro) and his team. Make sure you play at Baltray, if ever touring down the East coast.